Dauntless Open Beta Coming Soon | Nerd Much? 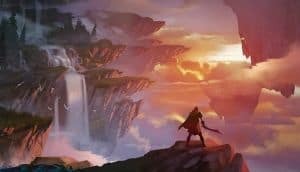 While a bit under the radar, Dauntless has some legitimate promise. And a growing following too. And beginning in May, that following is about to get much, much bigger. Phoenix Labs, developers of the game, have announced that Dauntless is making its move toward an open beta. Over 100,000 have already experienced the game during the title’s closed beta that began back in September. And 700,000 have already signed up to participate in the Open that will begin next month. If you’ve yet to see Dauntless for yourself, the game is quite similar to Monster Hunter World. You and online friends explore the world of the Shattered Isles. There, you’ll hunt down and eliminate deadly, large creatures known as Behemoths. These Behemoths are described by the Phoenix Labs as “ferocious beasts, hungry to drain the very essence from the world.” Upon a Behemoth’s defeat, you’ll earn loot that you can take into the city to craft new weapons and armor. So yeah, very Monster Hunter World-ish. Phoenix Labs announced today that the open beta period will begin on May 24th. This is the culmination of over four years of development on the title. Dauntless will be free-to-play, with an in-game store that offers cosmetic items. The developers have promised that you’ll find no pay-to-win mechanics, pay walls or loot boxes. Dauntless will be free to download when the open beta launches for PC on May 24th. You can sign up at the game’s site for notifications.